Cultivating a fantastic work environment has shown to be one of the greatest assets to an employee. Those working 40 hours a week or even more often say that they feel like the majority of their life is spent at the workplace. So, when an employer can recognize this and give back to their employees, it can make all the difference in both the employees well-being and the productivity of the company. At St. Paul Chiropractic & Natural Medicine Center, we offer wellness events for St. Paul businesses looking to improve the quality of their business. At St. Paul Chiropractic & Natural Medicine Center, we want to give back to our community in the best ways we know how! We can help your business grow through on-site office chair massages, health and wellness workshops, and company health fairs. Educational presentations on health and wellness are a great opportunity to show your employees you care about their health both inside the work environment and outside as well. Both an employee and employer favorite, on-site office chair massages are a great way of telling your employees how much they are appreciated and how understanding you are of their workload. Additionally, a 15 minute massage has been said to decrease job stress, increase alertness, and decrease employee turnover. It is a genuine win-win. 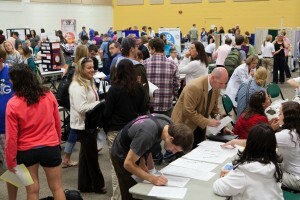 Health fairs also seem to be a huge win-win for both employees and employers. St. Paul Chiropractic & Natural Medicine Center can provide a health fair that is both interactive and informational. Here we can provide health care screenings, sampling of products, and discounts to your employees. This fun and engaging fair will help both you and your employees learn the value of keeping up with their health. Not only is it easy to start a wellness program for employees, St. Paul Chiropractic & Natural Medicine Center provides a variety of options that are tailored to your company’s needs. We have options that include wellness plans covered 100% by the company, co-pay options that allow both the employee and employer to contribute, and an option where employees pay for their massages. We love our wellness events, as well as our employee wellness programs that we offer to businesses in St. Paul. Fore more information about our events or to find out more general information about St. Paul Chiropractic & Natural Medicine Center, give us a call today at 651-644-7207.